Tofu or bean curd is one of those "new age", California, "granola eater" type foods. It is a great source of protein that is low in calories and contains beneficial amounts of iron. The production of tofu from soy milk is similar to the production of cheese from milk. We like to think of it as "bean cheese". It has little flavor so adults will need to season it to make it palatable. For baby tofu is a great first finger food because it is soft enough to mush with little or no teeth but substantial enough to pick up with little fingers. Firm tofu is dense and solid and is higher in protein, fat and calcium than other forms of tofu. Soft tofu is a good first choice for baby because it has shape but is soft enough to mush it baby's mouth. 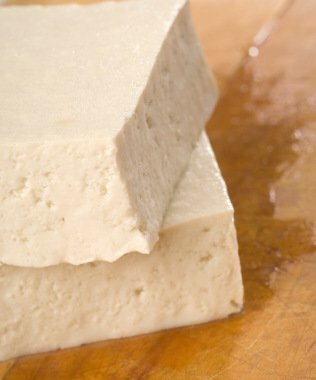 Silken tofu is made by a slightly different process that results in a creamy, custard-like product. This is the softest and can be mixed with other fruits and vegetables. For our purposes, we suggest buying soft tofu and then moving up to firm as baby can grasp his/her own food. Cut off little chunks and feed to baby. Once the tofu package is open, leftover tofu should be rinsed and covered with fresh water for storage. Change the water daily to keep it fresh, and use the tofu within a week. You can also freeze tofu (wrap in plastic wrap or put in a ziploc) for baby size servings. Soy beans are a heavily sprayed legume. Their shells should protect them from pesticide contamination, but the USDA has not made a recommendation here. We are going to give two recipes - one sweet and one savory. Add to blender, blend, and drink! Chop tofu and scallions and add soy sauce. Serve with rice. 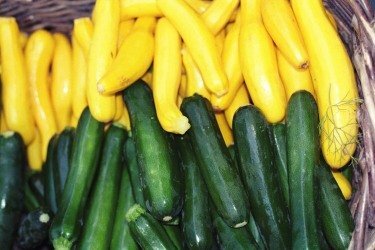 There are 2 easily available forms of summer squash - yellow summer squash and zucchini. 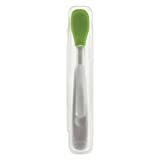 Zucchini is the green one that has the same oblong shape as a cucumber. Both of these vegetables will work for our purposes, and they are interchangeable in recipes. They are varieties of the same species so if you introduce one of the two then you don't have to worry about food allergies to the second. These are best eaten in the summer when they are the freshest and sweetest. Summer squash is very versatile. You can eat it raw or cooked, steamed, fried, grilled, and roasted. Look for firm squash that has glossy skin. For baby, it is probably still too hard in its raw state to serve, so you can steam it a little to soften. Chop into bite size baby pieces and place in microwave with a few tablespoons of water for 3 minutes. Alternatively, put in saucepan with enough water to cover bottom of pan and bring to a boil. They should be soft very quickly. Finally, you can roast some squash for yourself - see adult recipe below - and just leave the salt and pepper off for some baby slices. Stored in a perforated plastic bag in the refrigerator, they should keep for a week. Yes, but usually mixed with something else. No. The level of pesticide residue found by the USDA was very low. Roasting brings out the flavor of the squash and gives it some texture. We find steamed squash too mushy for the adult palate. Preheat oven to 400 F. Slice squash in half lengthwise and then cut again so you have 4 long pieces and cut across so you have 8 pieces. Cover a baking sheet with aluminum foil and brush with extra virgin olive oil. Put squash on baking sheet and drizzle with extra virgin olive oil. salt and pepper. Cook until soft - about 15 minutes. Don't worry about your baby having "square meals" - allow your baby to eat what he/she feels like eating. Look at your baby's eating from an entire week's perspective instead of one day. For example - "All my baby wants to eat is bananas!!" - well that might be true for a few days but then they will eat something else (we promise).